What qualifies Julie to be a coach? What do past and current clients have to say? Did you receive one of these cards? Want to know the story behind it? It translates several ways – “the light in me sees the light in you” or “the God in me sees/honors the God in you.” Last week I was wearing it while reading through posts and comments about “types of moms we hate.” The article was slightly tongue-in-cheek, but it rubbed me the wrong way. Parents are criticized from every direction, well-meaning or not. It made me turn inward to the support I seek to give. I certainly intend to honor my fellow parents out there, but perhaps by posting what’s working at my house (rather than highlighting the epic fails which can happen just as often) I may come across as catty and/or arrogant. That’s the last thing I’m after. I designed a simple t-shirt for Mother’s Day (everyday, actually) that embodies what I’m after… parents honoring parents, SEEing other parents and honoring the colossal job that it can be sometimes. Raising the next generation is important work. It’s full time even when it’s part-time. I know I need support. 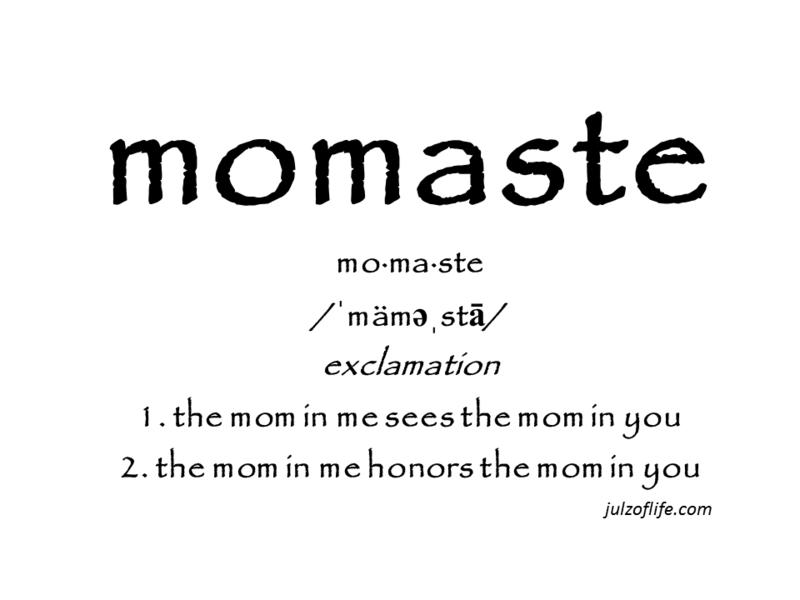 Momaste. The mom in me honors the mom (or dad) in you. Since then, I’ve been noticing… really noticing how much criticism there is out there from one parent to another. I’ve also seen the dramatic effects of the opposite. When we support one another, even stranger-to-stranger, AMAZING transformations can happen. 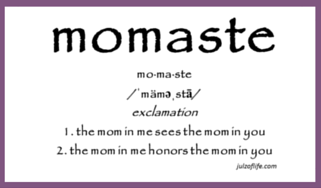 Where can I get a set of my own Momaste cards to brighten another parent’s day? Simply write to Julie@julzoflife.com and request them. A pack of them is just $5.00 to cover postage and handling. What else can I find to spread the word? We are in the process of constructing an online Momaste store. Mugs, bags, shirts, notepad, notecards and other fun items will be available soon! Stay tuned at Julz of Life and Momaste on Facebook for more details. Be Social with Julz of Life! Stay Connected with Julie and Julz of Life! Leading the next generation is tough, but you're not crazy and you're not alone. Julz of Life is here to help! When you choose to stay connected with Julz of Life, you'll get "tools of life" for keeping chaos creep at bay, first dibs at participating in free challenges, and details on great coaching programs! Join Julz of Life and FB and IG for F-U-N!